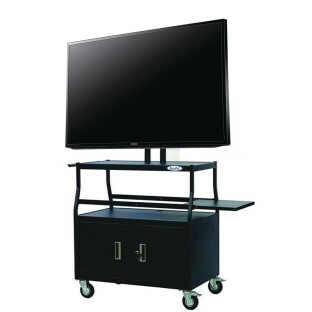 46" Smart TV Bundled with a Cabinet Cart! Cabinet features locking storage and 2 shelves. 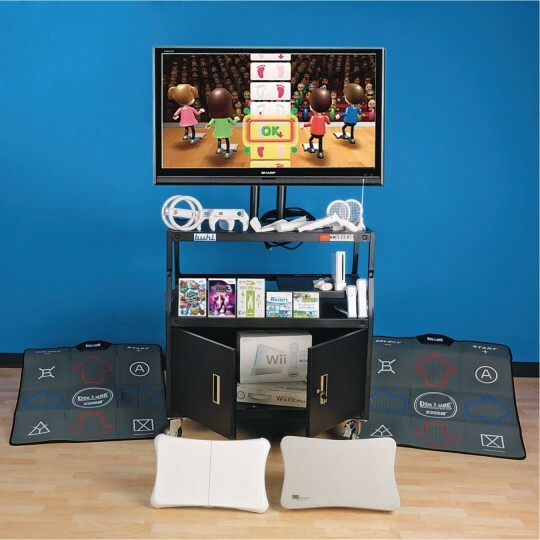 Store a Wii™ console, balance board, games and more! 28"H post with wire conduits with 4 height settings. Super sharp 48" Samsung Smart TV is bundled with a Buhl Flatpanel Cabinet Cart. The cart features a 32" x 17" x 17" locking storage cabinet with 2 shelves and enough space to store a Wii™ console, Wii™ Fit balance board, Wii™ games and all your accessories. The cart has a 28"H post with wire conduits with 4 height settings and smooth-rolling, locking, 5"-diameter casters. Key Smart TV features include: Motion Rate 120 for a greater level of motion clarity, Wide Color Enhancer Plus for a wider spectrum of colors on your screen and Eco Sensor, which allows your TV to intelligently adapt its picture according to the intensity of the light in the room. Please note that TV brand will vary based on availability. Brand and TV specs can be provided prior to purchase.